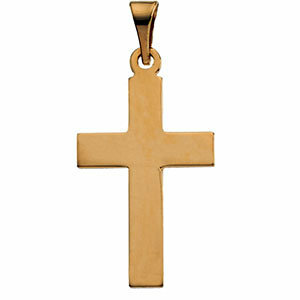 Keep thoughts of your Savior close when you wear this gold cross pendant from Apples of Gold. The premium quality 14K yellow gold makes a classically beautiful foundation for this cross pendant and gives off that excellent golden glow. This plain cross pendant matches perfectly with every wardrobe with its simple, clean lines and traditional design. A polished finish that's free of extraneous carving and patterns keeps this gold cross pendant a fresh reminder of the simplicity of faith. We guarantee our Plain Latin Cross Pendant in 14K Yellow Gold to be high quality, authentic jewelry, as described above.